Wolfenstein: Enemy Territory is a Multiplayer Online First Person Shooter. It's a team game; you will win or fall along with your comrades. The only way to complete the objectives that lead to victory is by cooperation, with each player covering their teammates and using their class special abilities in concert with the others. Featuring multiplayer support for as many as 64 players, Wolfenstein: Enemy Territory challenges gamers to the ultimate test of teamwork and strategy. Each of the five character classes is critical to a team's ultimate victory or defeat on the battlefield. The Covert Operative class allows players to steal uniforms, perform reconnaissance and gain access to enemy positions. While, the Engineer allows the Axis and Allied teams to lay and diffuse mines as well as build battlefield bridges, towers, forward command bases and other improvements in the midst of combat to gain advantages for their team. 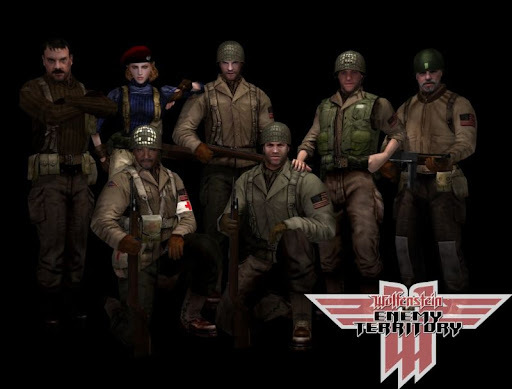 Wolfenstein: Enemy Territory further online players the option to slug it out in the intense Team Last-Man-Standing game mode, where squad-mates cooperate to ensure their team has the last surviving man on the battlefield. With new game modes, character classes, weaponry, and added tactical skills, Wolfenstein: Enemy Territory will keep gamers in the trenches for hours. PEI BAA DAI IN ENGLEZA DESCRIPTIUNEA DUTE MAMA NAIBII DE PRAPADIT! !